I wanted to drop in quickly to share what we did for Father’s Day gifts in case any of you procrastinated and need an idea for tomorrow. Actually, since the mugs have to cure for 8 hours this isn’t the best last minute idea. But it is do-able. I’m not selling this very well, am I? There’s a reason I only lasted 3 days in retail (true story). Hey guys! I have a great Father’s Day gift idea to share with you! 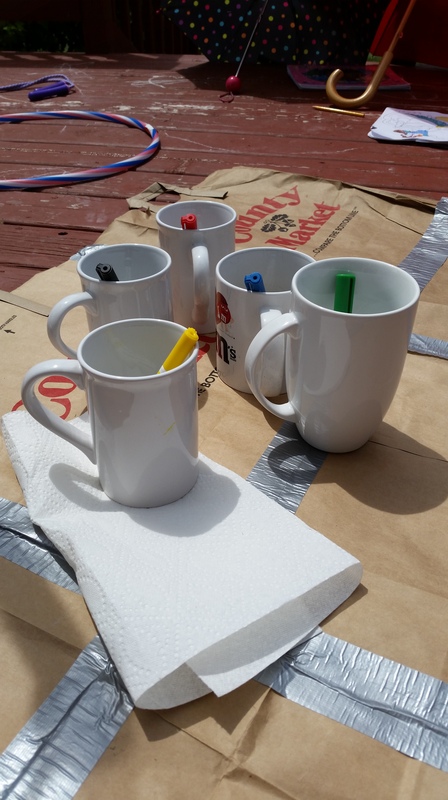 It’s totally original too–coffee mugs! I know, totally not original. But honestly, Father’s Day and Mother’s Day gifts are kind of all the same, aren’t they? As long as it comes from the heart, mom and dad will love whatever you give them. Especially if the kids are invovled in whatever you put together. and Deco Art ceramic markers from Hobby Lobby. If you are reading this a year from now and have time, click the link to order them from Amazon to save yourself the hassle of going out to buy them. Anyone who has shopped at Hobby Lobby with kids understands what a blessing online shopping really is. I mean, why do they put all that breakable stuff right at the front of the store at the perfect height for tiny hands to reach? It’s like they want it all to be smashed into smithereens. I went with the stupid expensive ceramic markers because I’ve tried the Sharpie trick before, and it washed off after a month (hand washing too, not even dishwasher). Mind you, when I say ‘stupid expensive’ I mean $4 a pop. Since I decided to buy every color of the rainbow, it added up quickly. What can I say? I over complicate things sometimes. But obviously you can use them again for other projects, so it’s not a total waste. 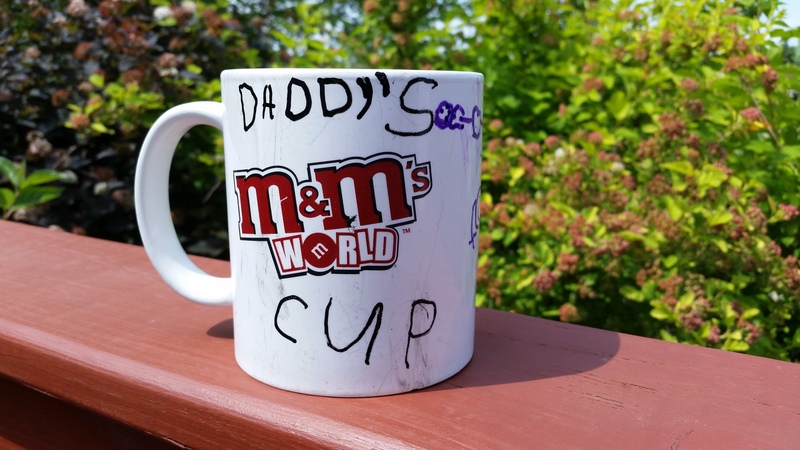 In case you’re wondering about the M&M’s cup in the picture, that is my husband’s coffee cup. I bought that for him when we first started dating 8 years ago and he has since drank his coffee in it every single day. 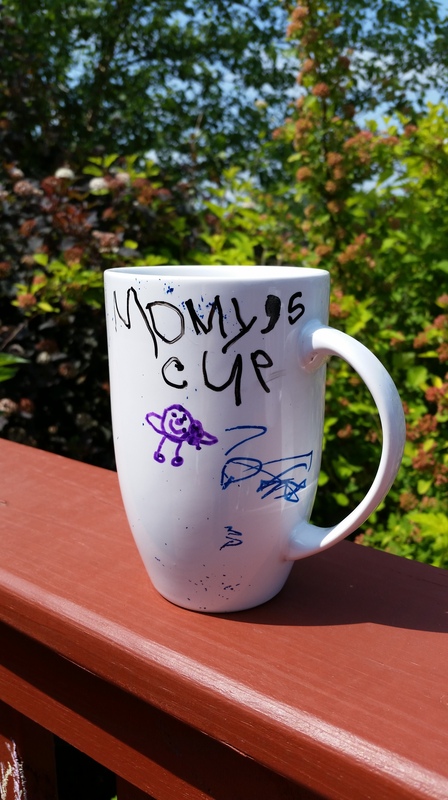 I knew that he would never actually use a different cup, so I thought it would be cute to let the girls personalize his cup. Plus this way, his gift is almost free. To prep the cups, clean the outer surface with a glass cleaner. 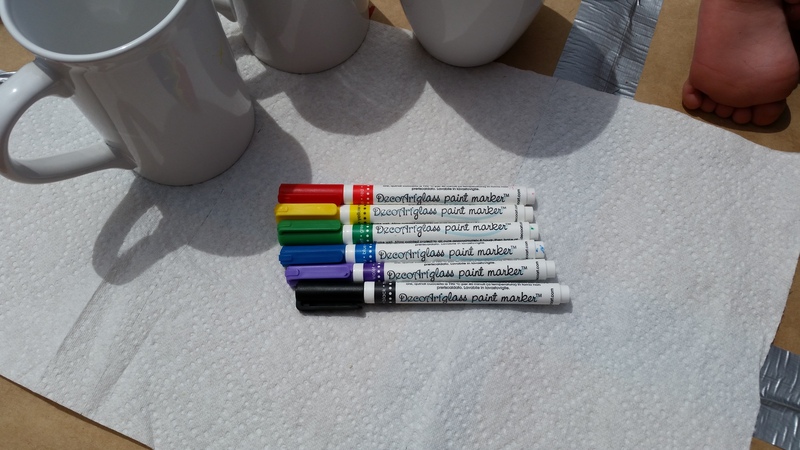 Then give the markers a good shake, because they will run if you don’t. If they do run a bit while you’re working, you have a small window when you can very easily wipe it off with a paper towel. Then for the fun part–let the kids doodle all over them! Bonus points if you have a kid who can write their names. Then you let them cure for 8 hours (I.E. Sit on the counter without the kids touching them). Last step is to bake them at 375 degrees for 40 minutes. When they’re done, turn the oven off, open the oven door, and let the cups cool inside the oven. That’s it! Easy, right? Totally adorable, and dishwasher safe. We did the same thing for Mother’s Day, but I forgot to buy myself a mug when I was shopping. So I took this opportunity to have them do mine too. I almost told Eowyn that she forgot an ‘m’ in Mommy, but I like it better this way. If you want fancier mugs, then you can also buy plain white mugs at Target for around $3-$5 a pop. Mine was actually from Target. Not because I’m cheap with other people, but because when I went to buy mine the Dollar Store was out of stock. 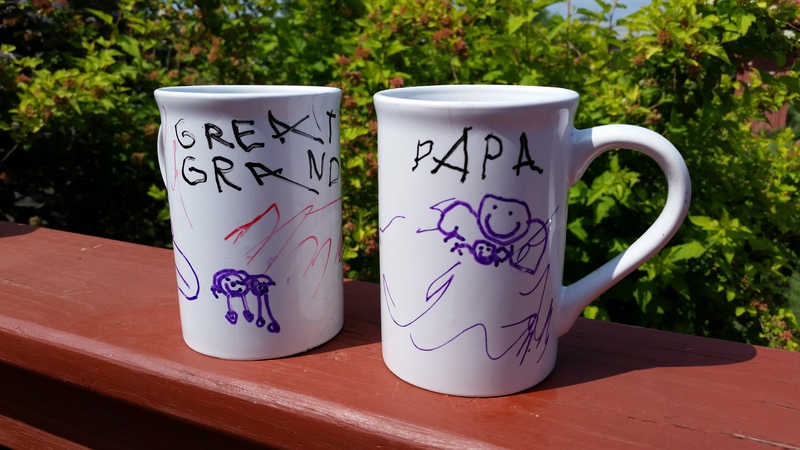 Regardless of where you get your mugs, I know the dads and moms in your life will love these homemade lovelies! I hope you all have a wonderful Father’s Day celebrating your awesome dads! Today was just a low key day at the house. We just hung out doing the best thing–nothing at all. Eowyn had dance class in the evening. During the class, one of the other moms came up to me and asked if I wouldn’t mind keeping an eye out for her kid so that she could pop over to a nearby store to get a Christmas present for her other kid. Of course I said I didn’t mind at all. She ended up getting back before the kids came out to switch into their tap shoes anyways, so all I really did was watch over her bag for her. But she was so grateful! 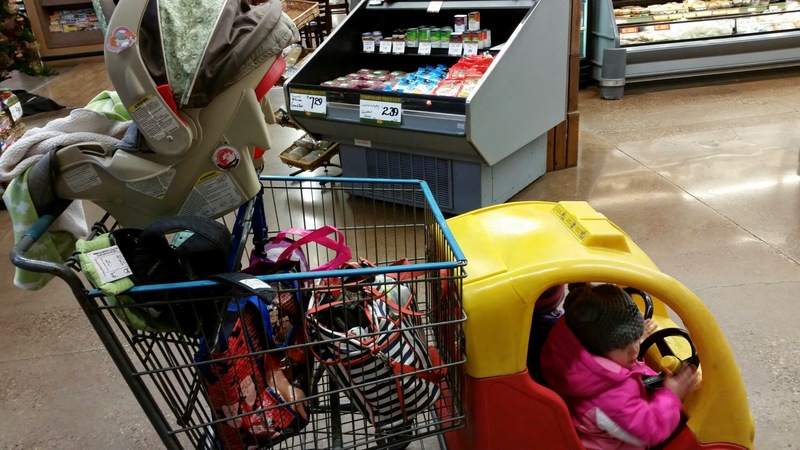 I totally understand how much easier it is to get a quick errand done without kids, and I was happy to have helped a fellow mom out in that way. So my first act of kindness today was completely unplanned and completely free. After dance class, we had to run to Target (of course; I feel like I live at Target). As we were walking out, I left a dollar bill in one of the empty carts for someone to find. 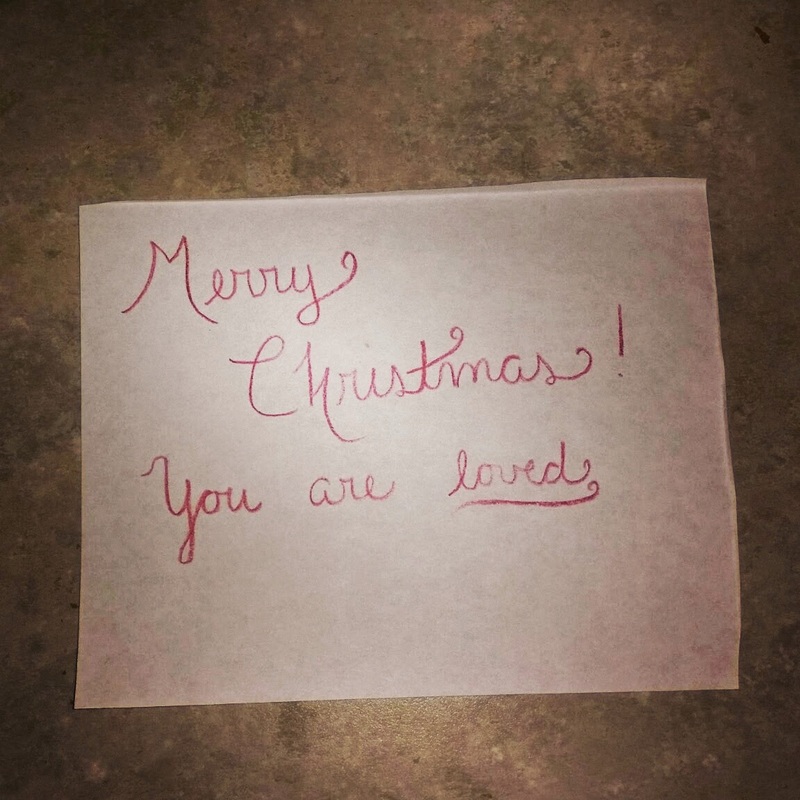 It always makes my day whenever I find a dollar laying around somewhere, and although I know that one measly dollar hardly makes up for the extra expenses incurred during Christmas, I hope that it at least brought a smile to someone. 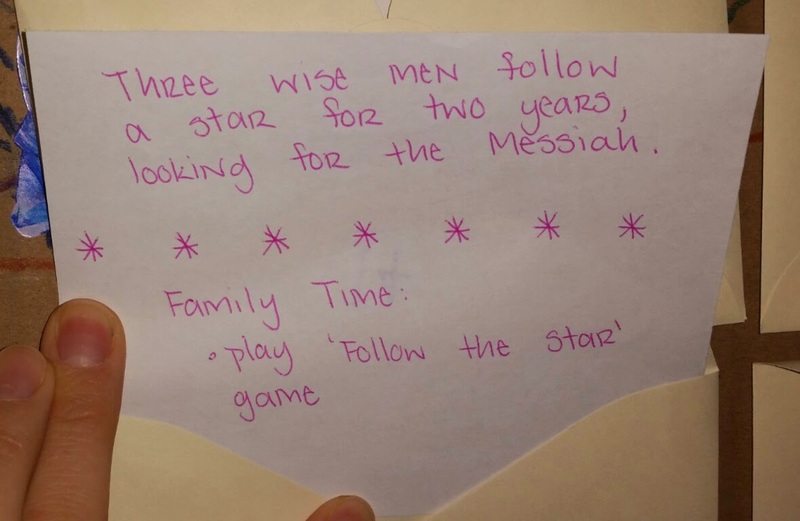 We again didn’t get around to doing our advent activity today, but I will again post it here for consistency’s sake. Another silly game of my own invention. 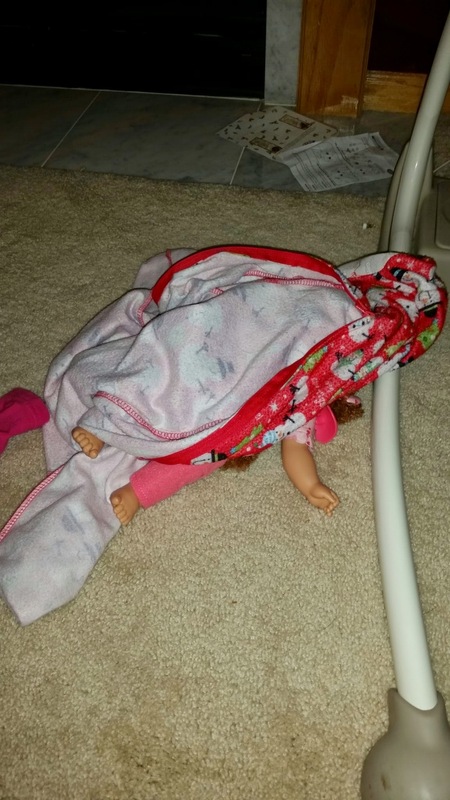 We took one of their billion baby dolls and hid it in random spots around the house for the girls to find. We didn’t get anything more than half the lights and the tree topper done last night, so today we focused on trimming the tree. 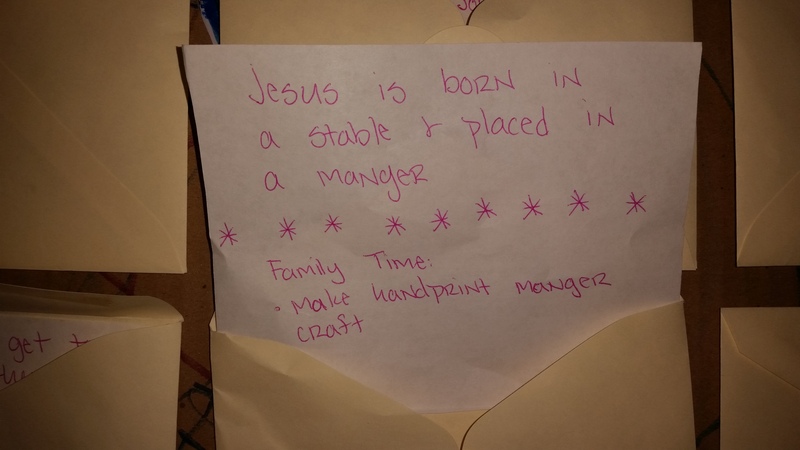 Somehow between that and nursing, we ran out of time to do our advent activity before we had to leave for a Christmas party this evening. The party was a 2 hour drive one way, so we got back super late. Way too late to do anything but put the grumpy kids to bed. 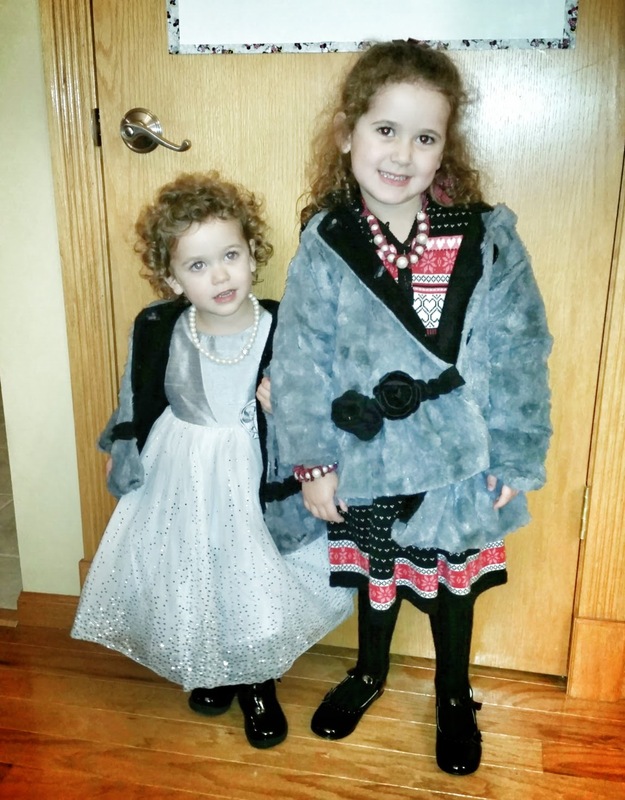 The belles of the ball! We actually didn’t get around to doing our advent until December 16th, but I’ll post it under this day for consistency’s sake. This game was super easy to set up. 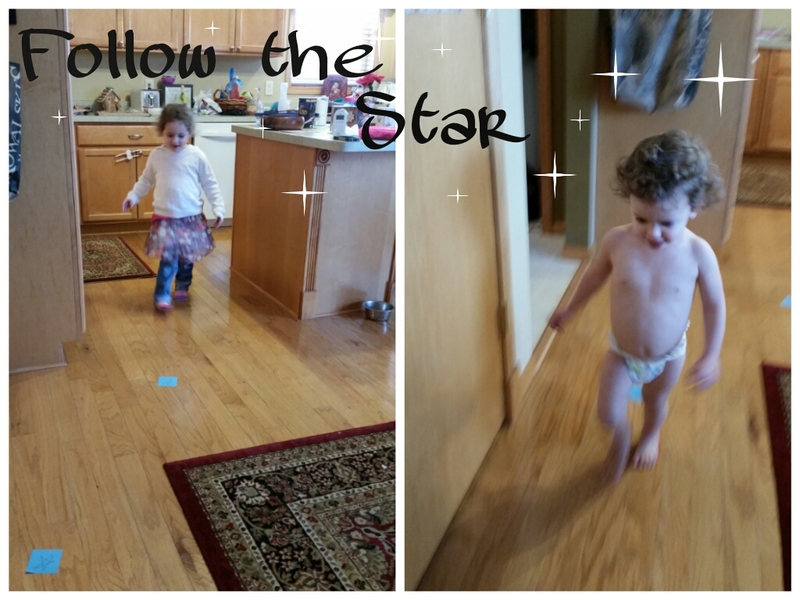 All I did was draw stars on post-its and stick them on the floor from the kitchen to the play room. 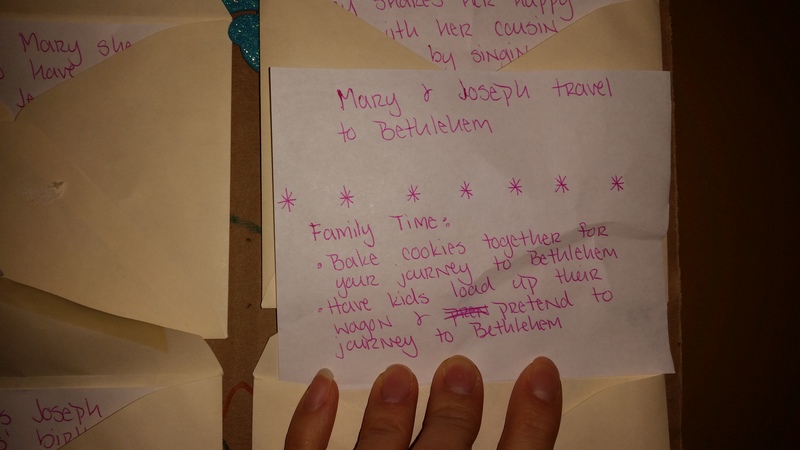 I gave them a start point and told them to follow the stars to Bethlehem! If you have older kids, you could do a night time version by hiding glow sticks in the back yard for them to find. Again, it was simple. But the kids had fun, which is all that matters! Unfortunately, we didn’t do a random act of kindness today. The opportunity didn’t really present itself, and I didn’t want to force it. My one and only rule that I’m sticking by this year is: if it stresses us out, we stop doing it. 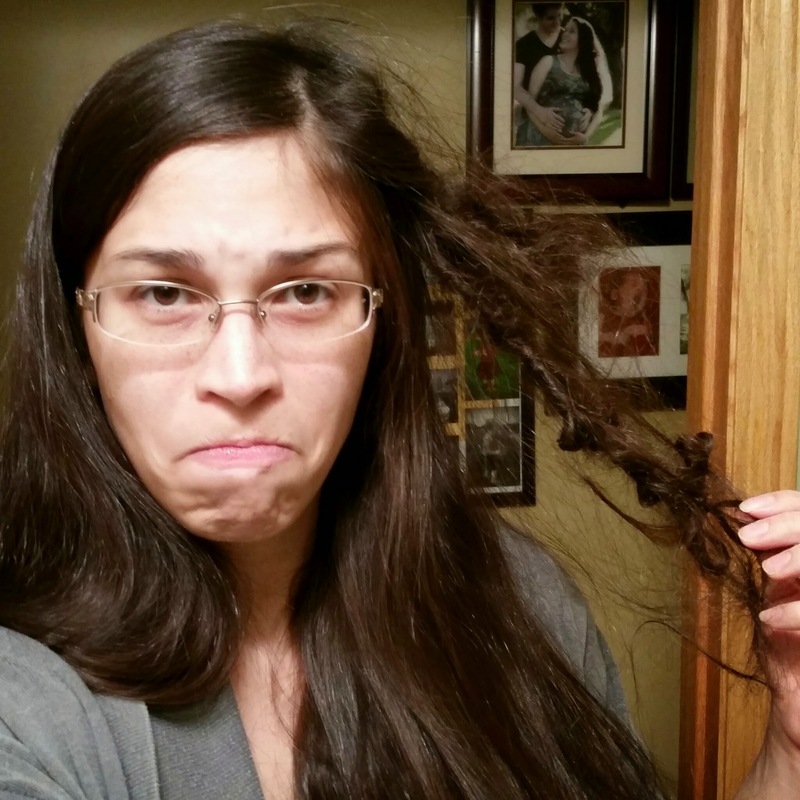 Sometimes life with young kids gets the best of you, and today was one of those days! As long as we are putting our best effort into every day, we can’t beat ourselves up when we don’t get every single thing done. It’s the heart that counts. Today was a busy day. It began with a 9:45 am call for Eowyn’s Nutcracker dress rehearsal. 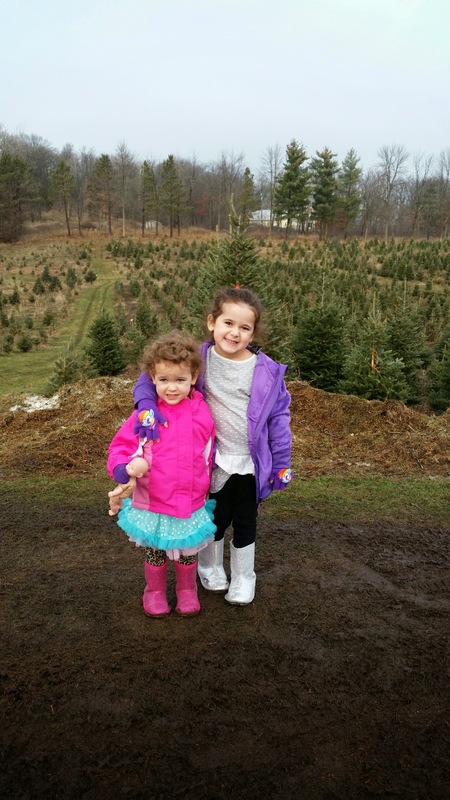 We came home for lunch, and then went to a local tree farm to get a Christmas tree. While we were paying, they asked if we wanted to be put on their email list. I’m all about supporting local small business, so I was happy to give them my email address. Tyler noticed that they were collecting emails on a sheet of paper instead of directly inputting them into a computer. While he’s not an internet marketer, he does have experience in that field and knows quite a bit about it. He couldn’t help but ask why they were collecting emails that way, and before I knew it he was sitting down with the owners for 40 minutes giving free advice. It turns out they were being majorly ripped off by the company handling their website. He left them his contact information in case they ever had any more questions. So our first act of kindness for the day was completely unplanned and completely free. All it cost us was our time. This kid genuinely terrifies me. Oops. 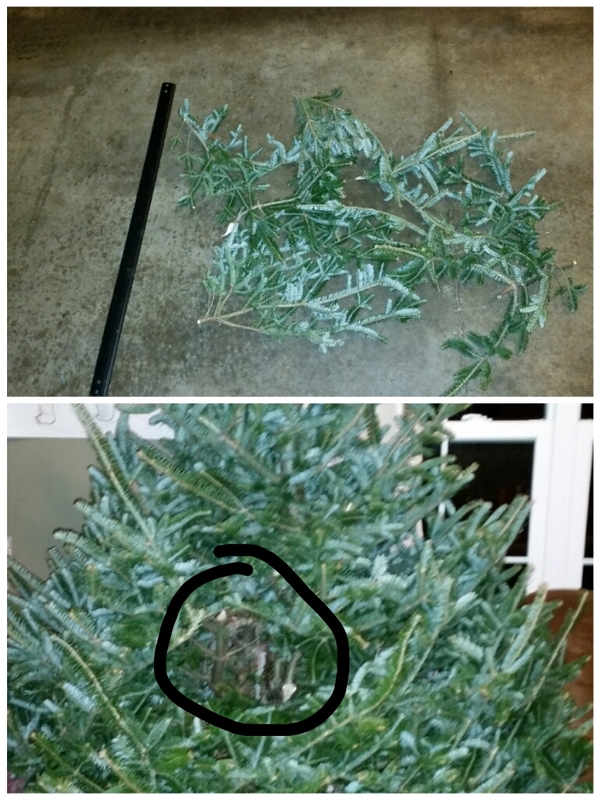 No problem; we just turned the tree so the messed up bit faced the wall. With all the tree trimming in our future, we decided to order pizza for dinner. 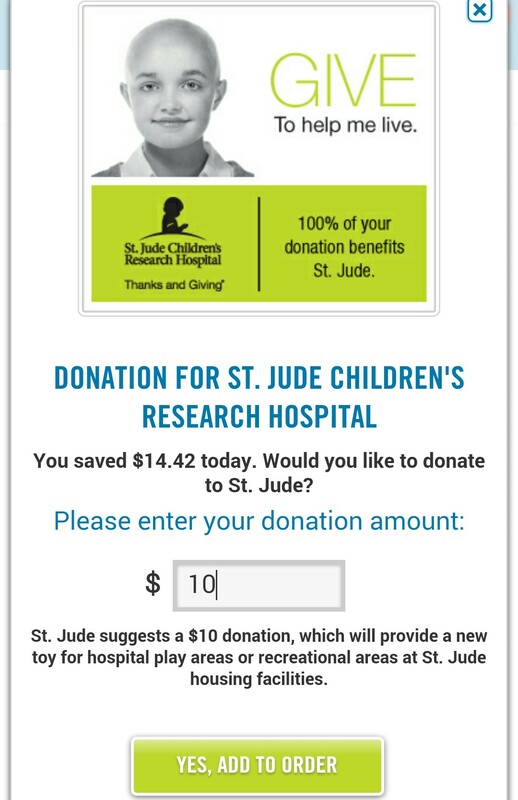 While placing my order online, I was asked if I wanted to donate money to Saint Jude’s Hospital. I love all that they do for pediatric oncology, so I donated $10. Our pizza was delivered to us by a man who looked to be in his late 40’s, early 50’s. Definitely not your typical college aged delivery boy. He pulled out 2 boxes, but we could tell that it wasn’t our order because we had ordered 3 pizzas and chicken wings. Upon checking the receipt of that order, he confirmed that it was for another house, apologized, and went back to his car to get our order. I really felt for this man who was too old to be working this job and was obviously having a rough night. God pulled on my heartstrings, and even though money is tight for us right now (and always) and even though I had just made an unplanned $10 donation, and even though he was kind of bad at his job, I listened to God’s nudge, and gave him a $20 tip on our $30 order. He asked how much change I wanted and I smiled and told him to keep it; “Merry Christmas!”, I told him with all sincerity. He looked up surprised and said, “Wow! It is a merry Christmas! Thank you!” He then went on to explain that he mixed up our order because he was tired from the 5 am start time of his construction job that he had had that morning. Pizza delivery is his second job. I’m so glad that I didn’t put God in the small box of our limited finances. God is the master multiplier (remember the 5,000 He fed with the 3 small fish and 2 loaves of bread? ); He can easily stretch our fixed income so that we don’t run out of groceries towards the end of the month. God blessed that man tonight, and it was a humbling thing to witness. So today, we ended up doing 3 RAOK instead of just 1. The OCD part of me wants to slightly freak out about this because it’s supposed to only be 1 act a day; what if I run out of ideas towards the end of the month because I banged out 3 in a single day? But then I remember that there are only rules if I make them. Kindness should come from the heart. It’s best not to plan too much, otherwise we’re putting God in a box. Move when the Spirit prompts you to, and trust that God is more creative than you. I’m pretty sure God can think of a new way to bless someone every day until the end of time. I just have to do my part by letting go of this bit of me that wants to control everything. He’ll do the rest. We finished the tree decorating for the night right before bedtime, so instead of singing Hark the Herald Angels Sing together, we sang O Christmas Tree around our newly lit tree. Hark the Hearld makes much more sense for the story, but our kids are too young to notice. They just enjoy doing stuff as a family, and so do I. Although I knew I would inevitably fall behind on my Christmas posts, I didn’t think I would get end-of-January behind. Sorry about that, guys! I first fell behind when my best friend was visiting us; I didn’t want to be like, “Sorry, I know you flew 2,000 miles to see me, but I have to blog”, because that’s rude. If I ever get to a point where I’m sacrificing relationships to blog, someone needs to stop me. People are always the most important thing. 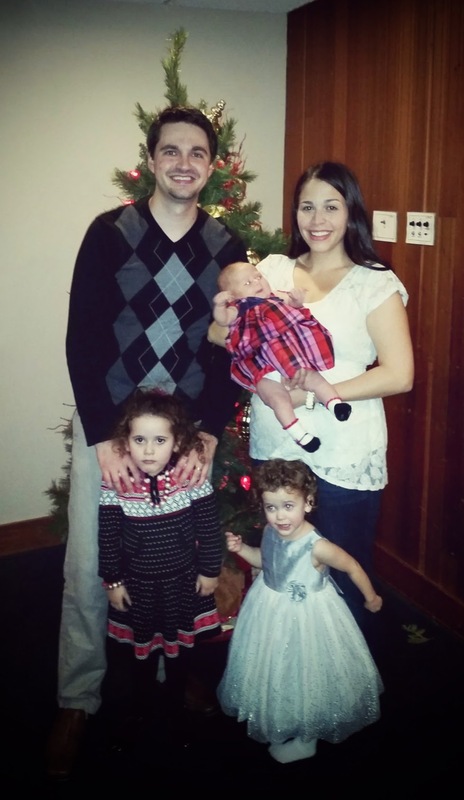 Then we just got busy with Christmas and have had back-to-back sickness in this house ever since. But, I’m here now and am vowing to finish this series up. 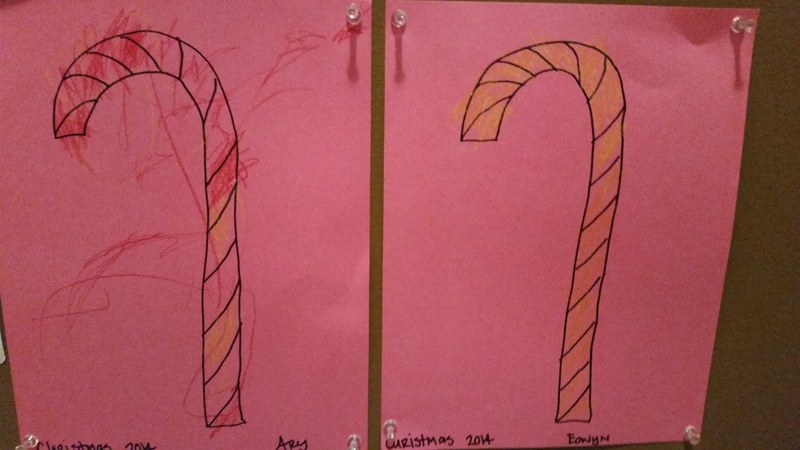 Our Bible themed advent calendar was a huge success with the kids and I want to share it with you. I decided to continue in the convention of writing about each day as if that day was today, if that makes any sense. One of my best friends came out from California and stayed with us for a week. 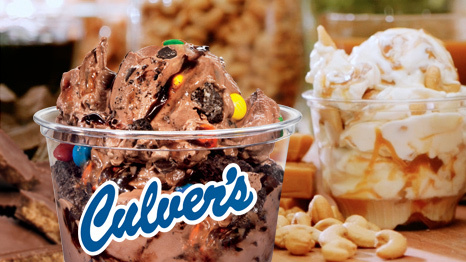 On her bucket list of things to do while in Wisconsin was Culver’s, because she had grown quite found of their famous frozen custard. So we had dinner at Culver’s tonight, and I paid for a custard and gave the clerk instructions to give it to the next person who ordered one. 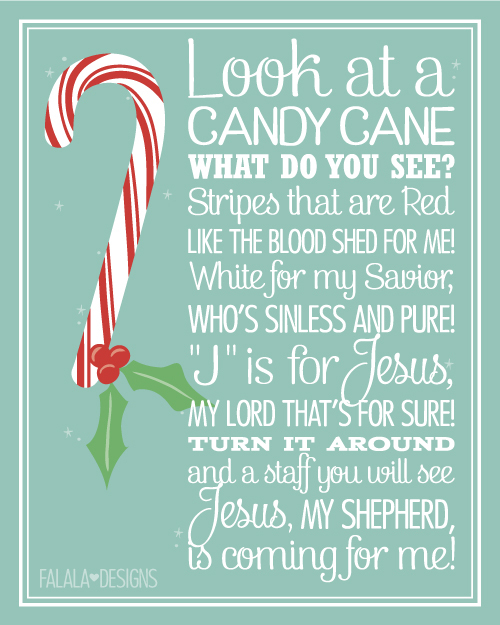 We did a simple shepherd’s staff/candy cane coloring. While they were coloring, we played “Little Drummer Boy” on my phone. I love that song because it paints the perfect picture of the true Christmas spirit. Unfortunately, our kids weren’t really listening to the lyrics because they were too busy coloring. Oh well; I’ll try again next year! We also talked about all of the symbolism in the infamous Christmas candy cane. Then we planted candy cane seeds that grew overnight into candy canes! This is an idea that I saw on Pinterest. 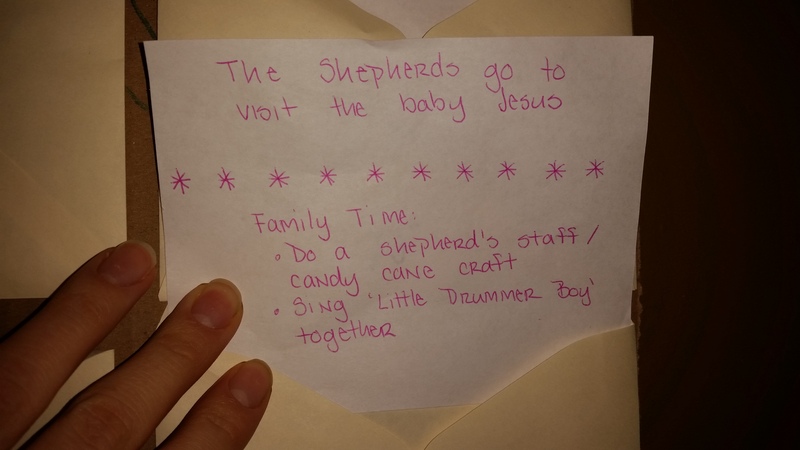 If you have young kids, you should check out this fun Christmas activity! 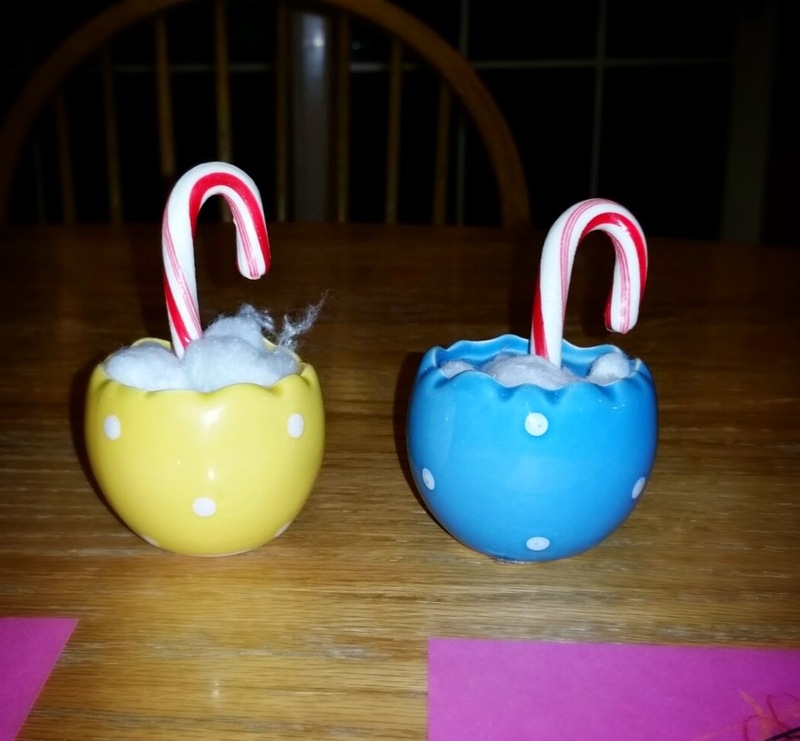 Before bedtime, have the kids “plant” a round red and white striped mint in a small pot, cover it with “snow” (cotton balls), and sprinkle candy cane food on top (white glitter). But the only way that it will grow is if it’s dark and quiet, so the kids must hurry off to bed so it can grow! After I told them that, Eowyn ran around the house turning all the lights off, and telling everyone to use their whisper voices. The girls climbed the stairs as quiet as mice, so as not to disturb their candy cane plants. So cute! Sure enough, there were candy canes in the pots the next morning. I told them that if they left the candy canes alone for another night, that they would grow bigger, but they both decided to harvest them immediately and eat their baby candy canes. This is definitely going to become a Christmas tradition while the kids are young enough to buy into it! It was pure magic watching their faces light up when they found their candy canes the next morning. That’s the stuff I live for. That’s the stuff that makes it all worth it. I won’t lie to you–we did not do a random act of kindness today. I actually went into the day with a plan for an act of kindness, but the day got away from me and before I knew it, it was bedtime and we never got around to it. I am not perfect and will never pretend to be. Most days I am disorganized and just trying to get through the day with my sanity in tact. I fail often. But I always keep trying. I will always continue to seek God’s will for my life. Even when it’s hard. Even after I fail yet again. Because I know that God’s path is the only one that will lead to happiness. So I cannot promise to be a model of perfection. But I will do you one better–I will always be real with you. And perhaps my gritty, real testimony of a simple stay at home mom life will speak to you and help you on your journey. We ran out of advent cards, so I had to get more done during nap time today so that we would have one to open later on. (Again–so not perfect!) 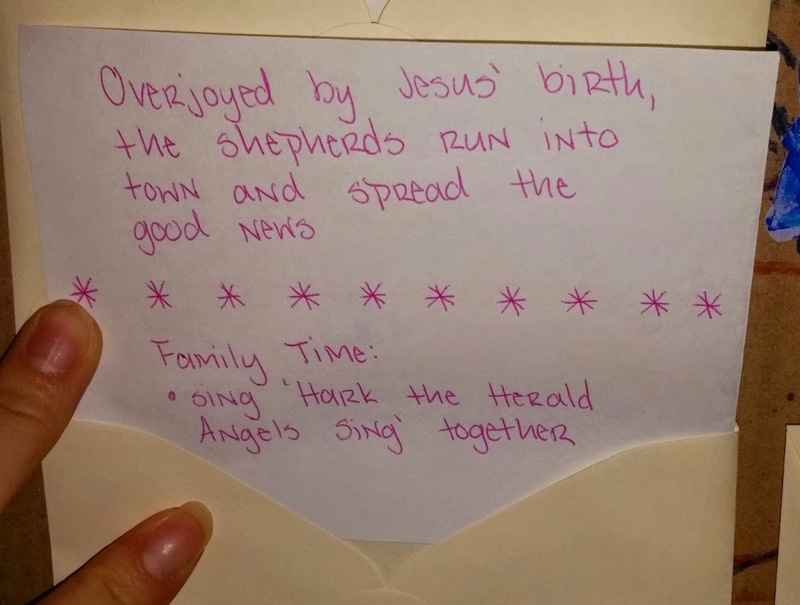 In fact, the card didn’t even make it into the envelope in time… BUT we did have one to read, which is all that matters. 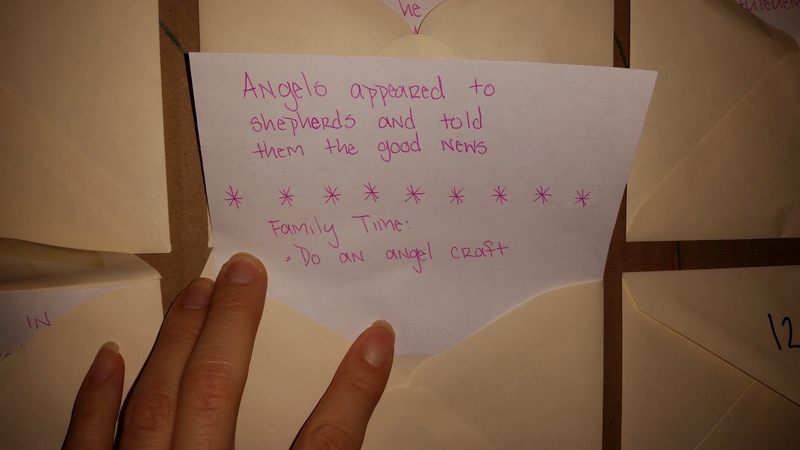 I kept the angel craft really simple because we started it at bedtime once again. 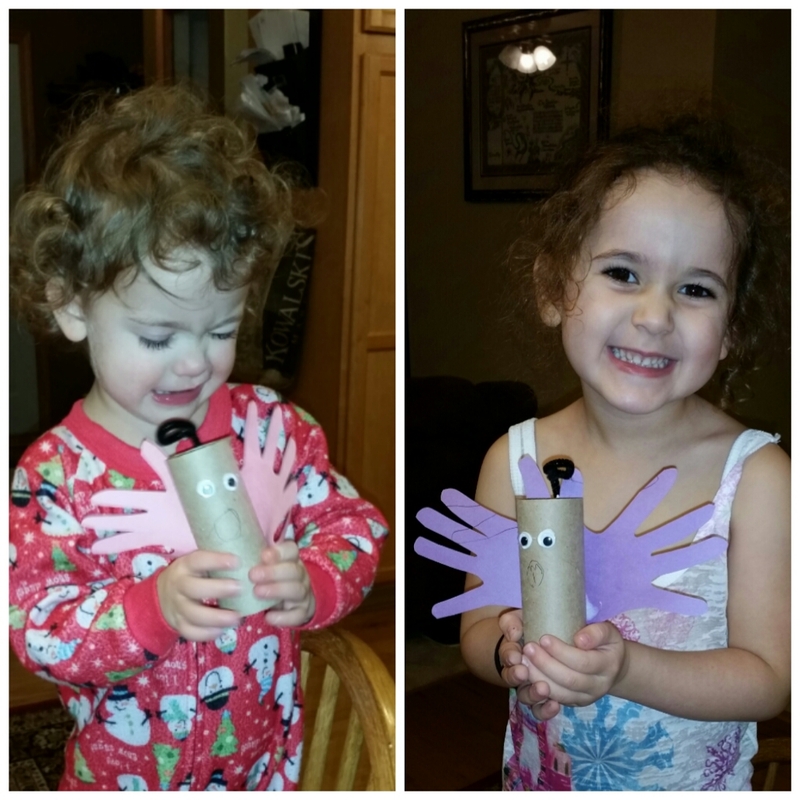 We traced out their hands and cut them out, then glued them onto toilet paper rolls. We then added pipe cleaner halos (black, because that’s all we had on hand), googly eyes, and drew on mouths. Quick, simple, and fun for the kids. Win. 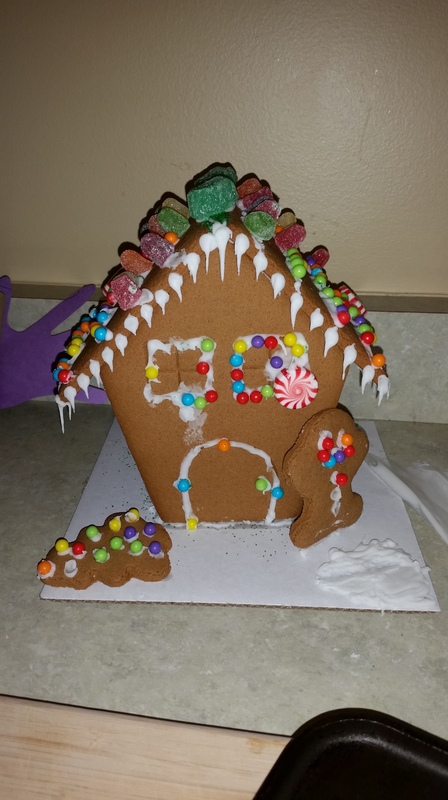 Before our advent activity, the girls and I put together a gingerbread house. I love doing these with them! 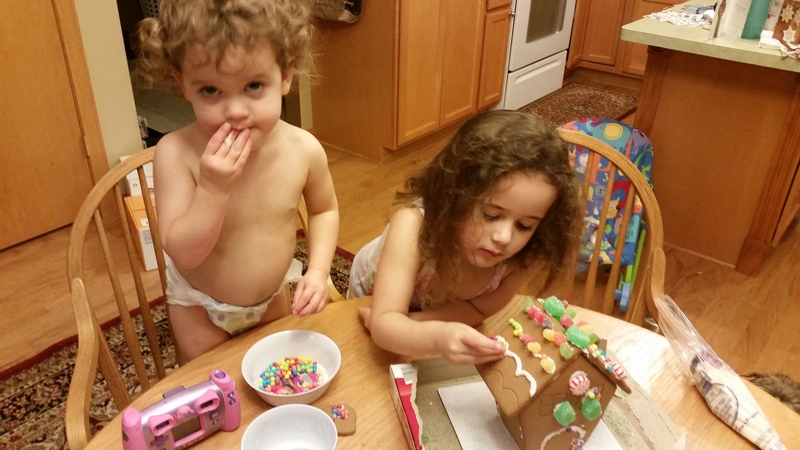 Of course, they ended up eating quite a bit of candy instead of using it to decorate, but that’s part of the fun. My favorite part is the knocked over tree in the front yard. Perfection is boring. I’ll take my dysfunctional life over a “perfect” one any day. Perfection isn’t the point anyways. For if we were perfect, then we wouldn’t need God. 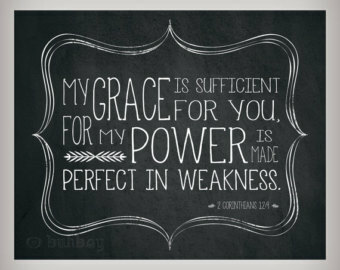 So I am glad to boast about my weaknesses, so that the power of Christ can work through me. We actually left the house today to go to the grocery store. Anyone who has gone shopping with 3 preschoolers knows what a big deal this is. For anyone who has never had this pleasure, riddle me this: once all the children, reusable bags, diaper bag and Baby Bjorn are in the cart, where is one supposed to put one’s groceries? You should celebrate Mother’s Day just for the sole purpose of marveling at how your mothers were able to feed you despite this very real challenge. Be grateful. Anyways, we have to bag our own groceries at our store, so we left an encouraging note at the bottom of a plastic bag for the next customer to find. Simple, effective, and best of all, FREE. The girls also gave $.5o to the Salvation Army bell ringers outside the store. 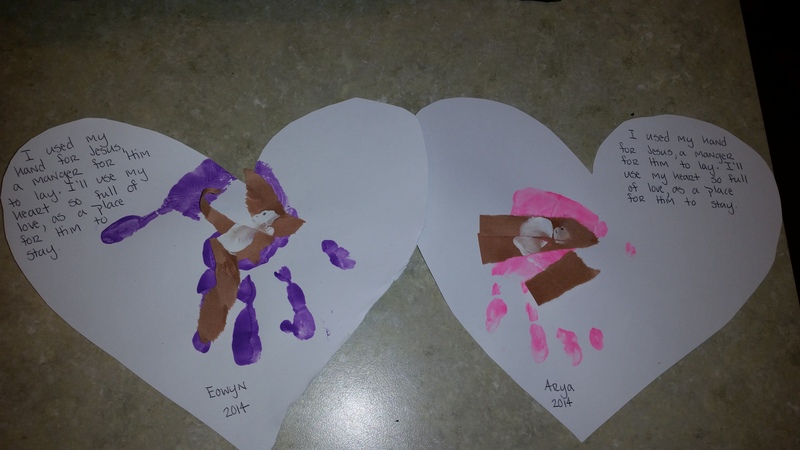 I found this nativity handprint craft on Pinterest and did it with Eowyn last year. I want to make it a tradition while they’re little because I think it’s so beautiful. “I used my hand for Jesus, a manger for Him to lay. We finally did a craft! 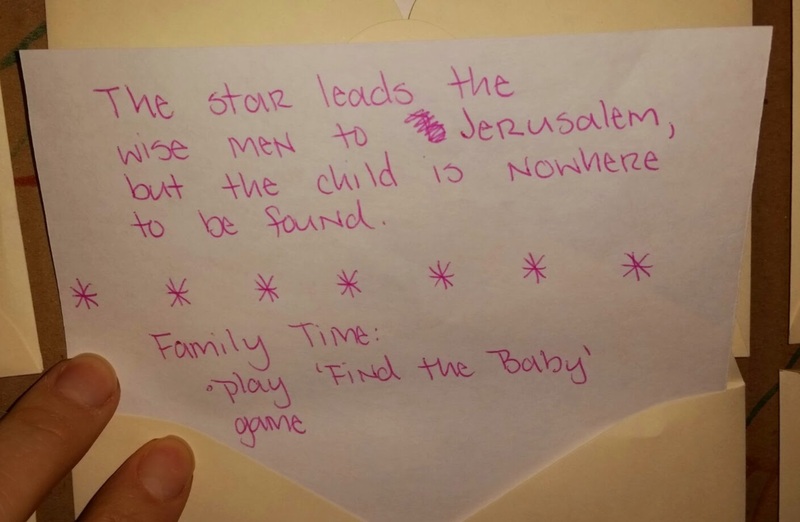 Gold star for this Momma. Today’s random act of kindness came from Eowyn. I put her and Ary down for a nap and then went downstairs to nurse Laurelyn. Ary was pulling her usual shenanigans, getting out of bed to mess around in the room. Eowyn tattled on her and I used our nifty 2-way baby monitor to tell her to get back in bed. Ary starts throwing a fit and through her tears yells, “I WANT MY BLANKET!” I tell her that I had already tucked her in and was not going to go back upstairs to do it again; she was going to have to get her own blanket. She cries even harder. Then she says through her tears, “I WANT SISSY DO MY BLANKET!” Eowyn rightly replied, “No.” Ary cries even harder. Then Eowyn sighs and says, “Oh all right. But just one time!” Then I heard Eowyn get out of bed and walk over to her sister’s bed and tuck her in. True love is doing something to help someone else, even when you don’t want to. Not only did she make her sister happy, but she also helped me out because I didn’t have to go upstairs to deal with Ary while I was in the middle of nursing. 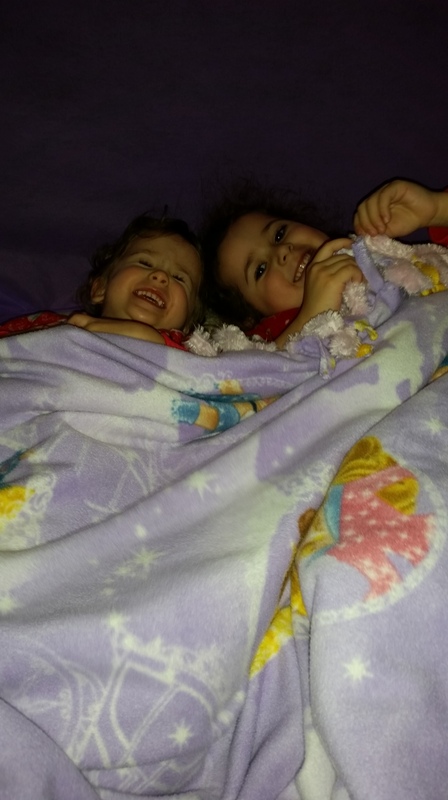 We set up their Tinker Bell tent in their room with pillows and blankets and told them there was no room at the inn–they would have to camp out on the floor. I have never seen these girls be so excited to go to sleep. They got ready for bed in record time! We should let them sleep on the floor more often. After Eowyn got her pajamas on, she asked me, “Mom, are we really sleeping in a real tent? 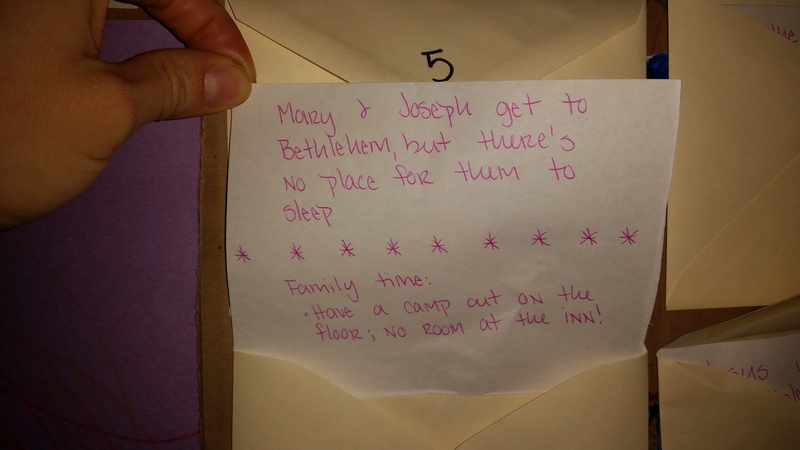 You’re not just kidding?” I doubt Mary and Joseph were as excited to sleep on the floor that night thousands of years ago, but our kids were loving it. Of course after Eowyn fell asleep, Ary started messing around in the room in her fight to stay awake. So she ended up being put in her bed and Eowyn slept by herself in the tent. 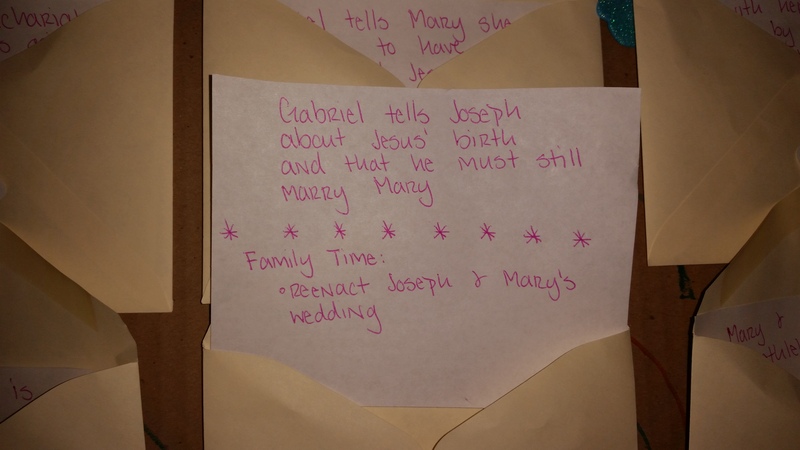 An idea for older kids would be to volunteer at a homeless shelter as a family for this day, because Mary and Joseph were homeless that night. 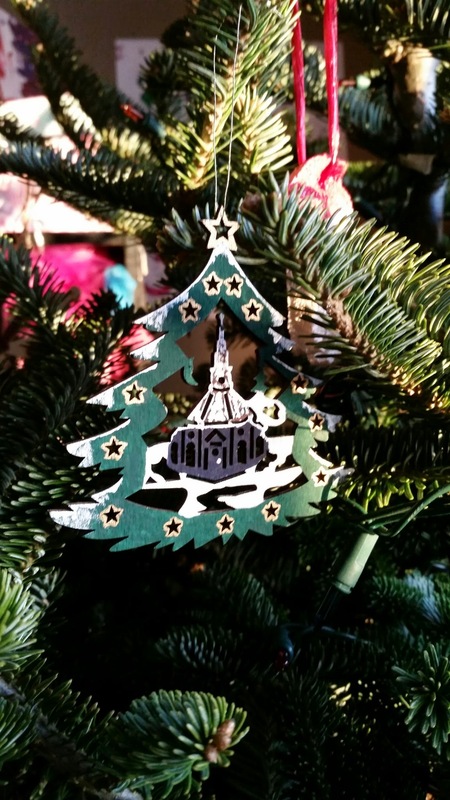 I hope you are all enjoying the first part of the Christmas season! At one point while I was nursing Laurelyn today, Eowyn came up to me with one of her barbie dolls. “Mom, we can give this doll to someone else who doesn’t have any toys because I don’t play with her very much and I know it would make them really happy.” I then suggested that we go through all of her toys and collect the ones that she’s outgrown to give away for other kids to enjoy, and she agreed. So we sat down and did just that. 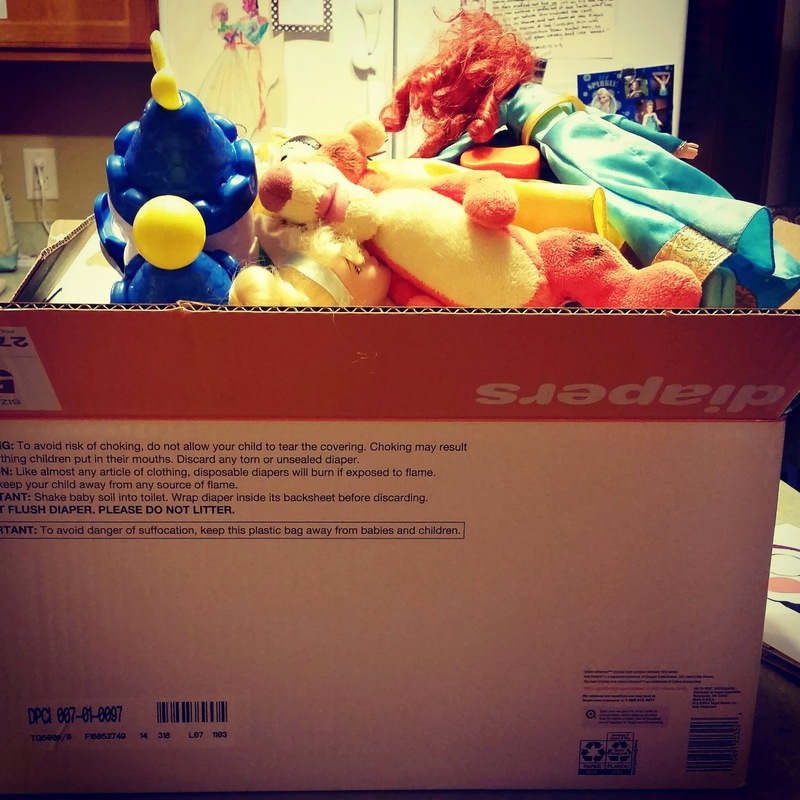 Half and hour later, she had filled a box with toys to be donated. It was 100% her idea. I never pressured her and I let her pick out every toy because I really wanted it to be her decision. There were no fits; she gave happily from her heart. I am ashamed to say that I have yet to make a single cookie this Christmas season. I’ve been so busy making birthday cakes that I haven’t had any time for cookies, which is one of my favorite Christmas traditions. On this night, the kitchen was still a wreck from the Frozen cake that I did, so baking cookies was out of the question. Instead, we packed up a back pack with their play food. 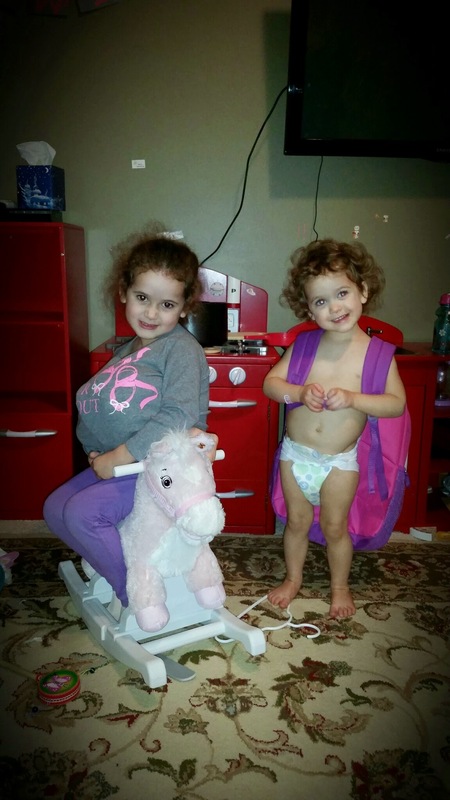 Then Eowyn shoved a doll under her shirt and sat side saddle on her rocking horse. Ary put the backpack on and led us to Bethlehem (turns out Bethlehem is in our kitchen; who knew?). Mary & Joseph are packed up and ready for their trip to Bethlehem! It’s moments like that which leave me in awe of what training up a child actually is. 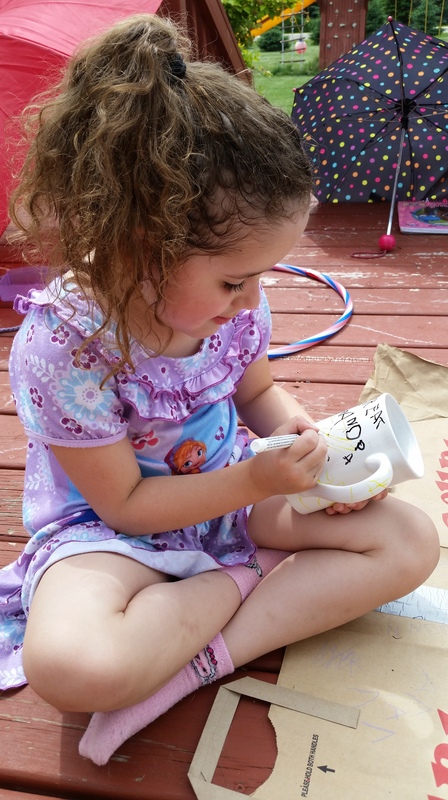 It’s so easy to lose the importance of parenthood in the routine of sippy cups and laundry. 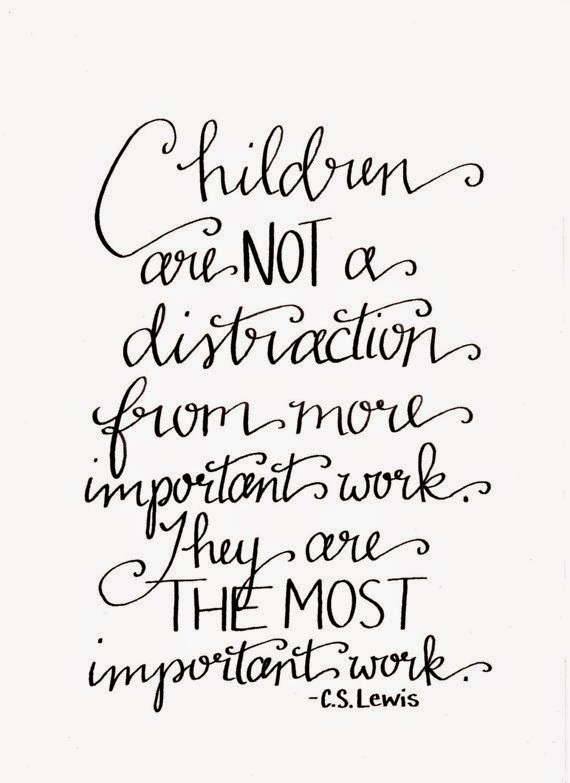 It’s so easy to forget how important our jobs as parents actual are. 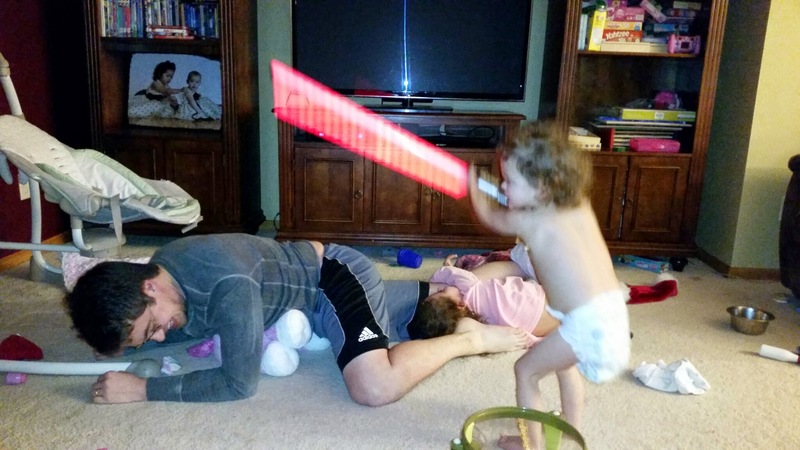 We are so much more than babysitters. We are in charge of crafting lives. It is the most important job we will ever have, and we must not forget that. After the non-stop activities of yesterday, I was exhausted when I woke up this morning. It was going to be a 2 cup morning for sure– Except the coffee maker stopped working. I spilled coffee grounds in the water tank on accident a couple days ago and now it seems to be clogged. Eowyn had a friend coming over at noon for a play date and now I was going to have to struggle through it without any coffee. As far as I’m concerned, my random act of kindness for today was getting through it without chopping heads off while 3 preschoolers ripped through the house in princess heels. When it was time for her friend to leave, Eowyn left her at the door and ran into her play room. 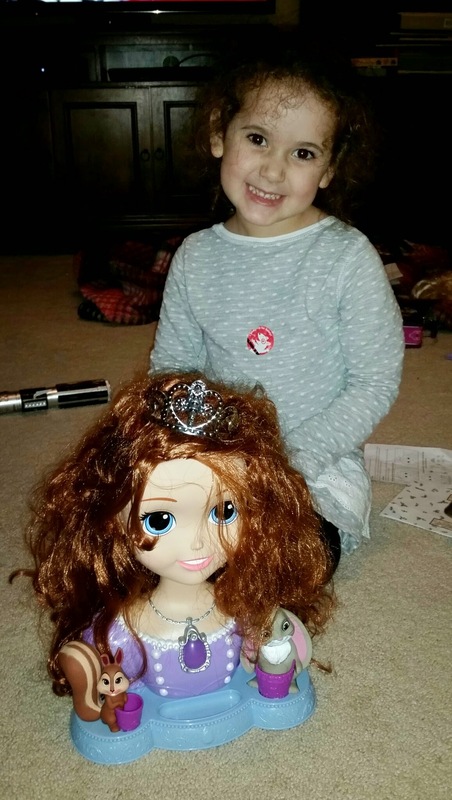 She came running back with one of her Frozen dolls and handed it to her friend saying, “You can take her home with you to borrow because I know you really liked playing with her.” My 4 year old did a random act of kindness completely of her own accord and without any prompting from me. I couldn’t have been more proud of her. Unfortunately life happened and it got too late/Ary got too grumpy for us to do our advent calendar today. So we just did two the next day (I’m writing this post after the fact). I told you that we’re winging it! But the number one rule of ‘don’t get stressed out by Christmas stuff’ has stayed in tact, which is all that matters. 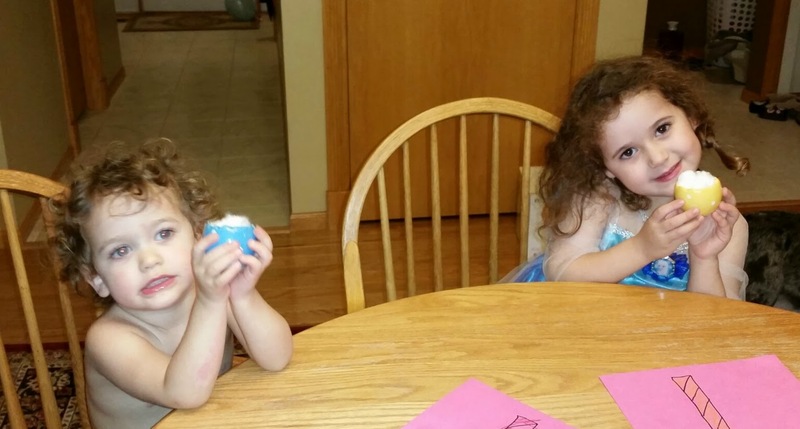 This was such a sweet activity to play with our girls. 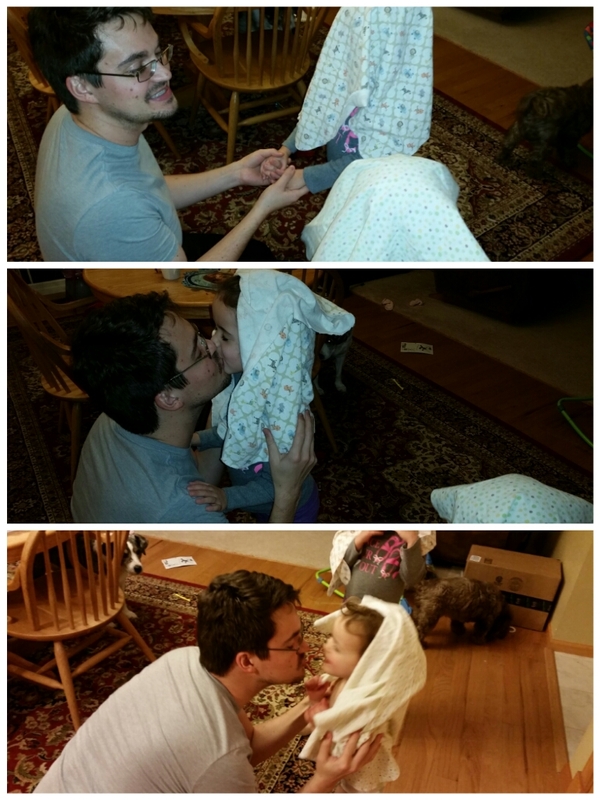 Daddy played Joseph and both Eowyn and Arya played Mary. 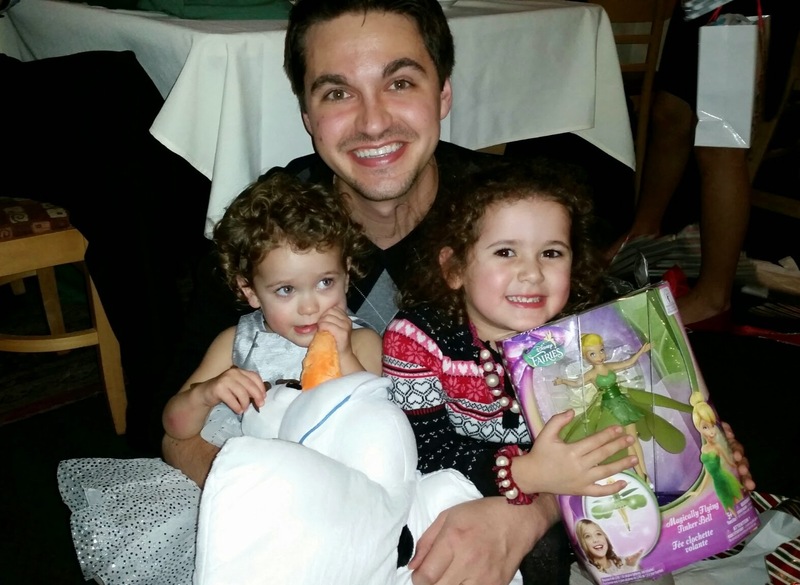 Eowyn asked Tyler if she could marry him just last week, so this activity was special to her. I both can’t wait yet dread the day that our girls get married. I expect I’ll need a lot of wine on those days.